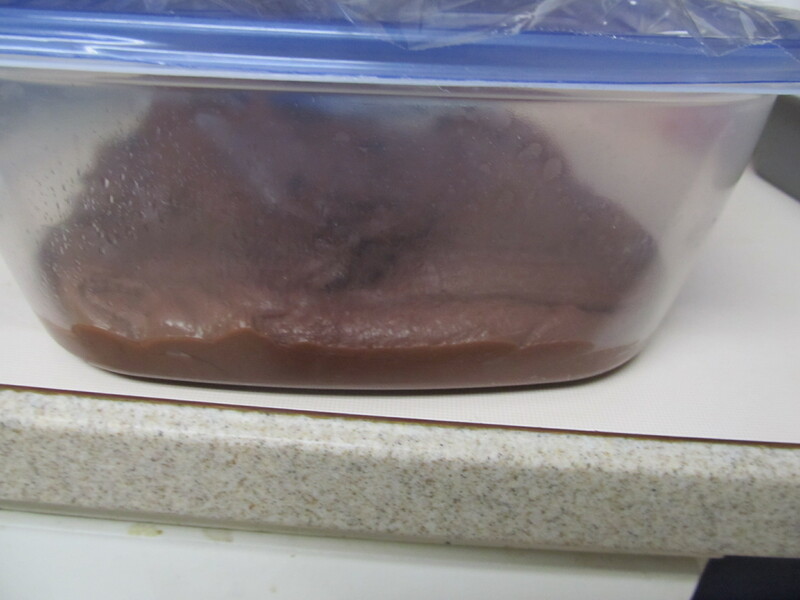 The kids’ Tae Kwon Do school has a dessert potluck for their promotions ceremony, and the Girl wanted to bring fudge, like Grandmother makes. This is something my mom has memorized, and she will rattle it off rapidly whenever you ask her, but I have never been able to memorize it. I emailed her, and was surprised to find out it is in a cookbook I actually own- Creme De Colorado, which was put out by the Denver Junior League years ago. Those junior leaguers- they know how to make fudge…I’m not even sure what I mean by that. The note on the recipe that my mom sent was “doubles easily” and I’d like to suggest that if you don’t double it, you’re crazy. As many dessert potlucks and choir thingies, and classroom parties and brunches as you get invited to this time of year, you might as well, because it is the same amount of dishes to wash, and same amount of time put into it. My mom uses a hand mixer for this- not the crank kind, the plug-in kind, and by the end it always smells like it is going to catch on fire. I have a kitchen aid stand mixer (best Christmas ever!) and it has the power to do it- you really want to have something with power, rather than using the brute force of your own muscles. The Girl likes to help with this- the dangerous part is pouring molten chocolate, so an adult should do that, but otherwise this is pretty kid-friendly. Melt chips and butter in a saucepan. Meanwhile, in a large bowl beat eggs until light in color, then add powdered sugar and mix well. Add melted mixture and mix well. 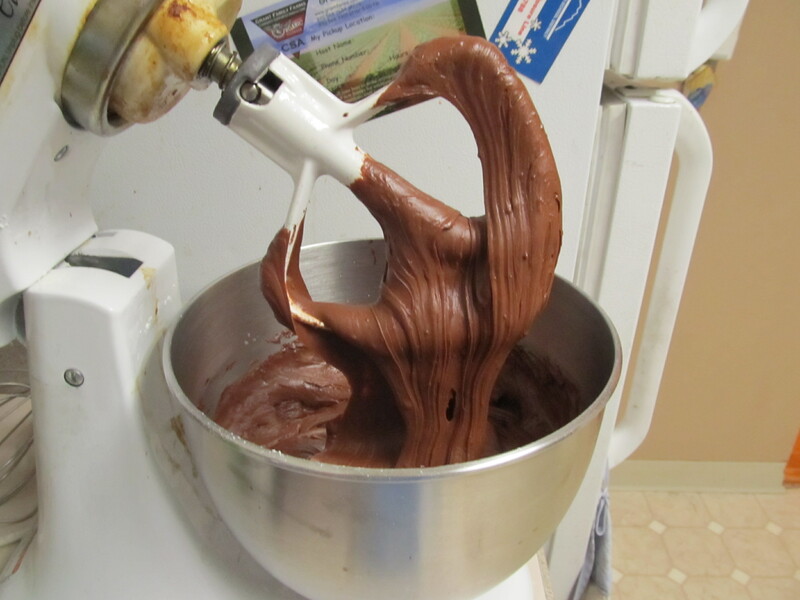 The heat from the melted chocolate will cook the eggs, but the sugar will help prevent them from scrambling. Pour this into a 9″ square buttered pan. Cool in fridge and slice. It's handy to put in the box, because I don't have to mess with plastic wrap, and can stack stuff on top of it in the fridge. DO store in the fridge, because of the eggs. I did this in two containers- one plastic box because it was for a weekend brunch, and a parchment-lined pan for the Tuesday Tae Kwon Do thing. My mom pours all of it into plastic boxes, because it’s easier to store and give away. Edited to add- I am doing another batch (single batch- we’re not superhuman!) of this to bring to treat day in the teacher’s lounge, and I am adding orange extract instead of vanilla. I am realizing that this is very much a “bag of chips, half bag of powdered sugar” type recipe. When my mom would rattle it off, I got lost, but having done it once, it is pretty much memorized. Tryyyyy iiiiiittttttt… you know you want to.